This eighteenth century pharmacy in Nice, Provence in France, is a far cry from the type of pharmacies that one would see nowadays. The pharmacy, Pharmacie Maire, built in the early eighteenth century in the Palais Lascaris in Nice, Provence in France is definitely worth visiting. 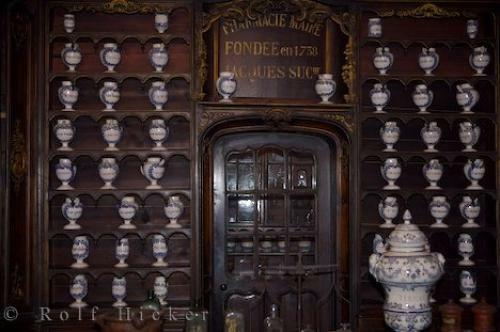 There are many of the old pots, jars and vases on display including some original delftware.Pharmacie Maire at the Palais Lascaris, Fondee a Besancon en 1738, Museum, Old Town, Nice, Provence, Cote d'Azur, France, Europe. Photo of an eighteenth century pharmacy in the Palais Lascaris in Nice, Provence in France, Europe.